Wolf Guts was in his late 70s at the time, so his son, Don Doyle, did not make the call, but said the request personified his father’s love of country. “He still wanted to help. He was trying to still be patriotic,” Doyle said. A Native American code talker from World War II, Wolf Guts helped defeat Axis forces by transmitting strategic military messages in his native language, which the Japanese and Germans couldn’t translate. 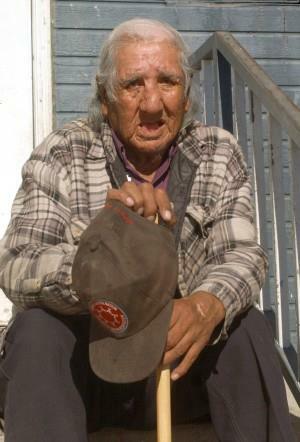 “He’s the last surviving code talker from the whole (Lakota) nation. It’s going to be a little like the passing of an era,” Doyle said. He and three other Sioux code talkers joined the Pacific campaign; Wolf Guts’ primary job was transmitting coded messages from a general to his chief of staff in the field. “He tried to keep it all inside,” Doyle said. Doyle said his father’s deeply religious way of life was also a part of the stories. He always thanked God for bringing him home. “I am deeply saddened to hear about the passing of Clarence Wolf Guts. He and his fellow Code Talkers have had a lasting impact on the course of history and helped lead the Allies to success during World War II. He will be greatly missed, but his contributions to our state and nation will live on,” said Johnson. “Clarence Wolf Guts was an American hero; he was courageous and self-sacrificing. I have a great deal of respect for Clarence and for the extraordinary contributions Mr. Wolf Guts made to our country. The efforts of the Lakota Code Talkers saved the lives of many soldiers, and for too long went unrecognized. Kimberley and I wish to express our sympathy to his family during this difficult time,” Thune said. Doyle said his father was humbled by the recognition, but was proud of his service during the war. Wolf Guts’ desire to help others continued throughout his life well after the war ended. From Paula – Thank you so much for your love of our country and your service. Peace be to you and your family. I’m sorry Kevin but I have no information or knowledge of this type of necklace. However, I thought by posting it, someone else might. And I’ve also asked a few of my friends if they have seen anything like it.